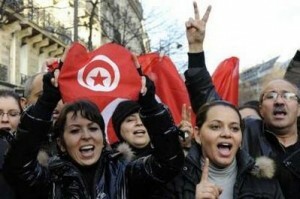 Tunisians are reaping the benefits of their mass uprising. Der Spiegel ran a story on Tunisians' new found freedoms of expression, association and speech. This is nothing short of miraculous. In the span of a month, Tunisia went from one the most tightly-controlled countries in the world, second only to China in online censorship, to a bastion of civil liberties. Apparently, Bourguiba avenue in Tunis has now turned into a free speech zone, where Tunisians come freely to discuss politics, each establishing their own "speakers' corner." Everyone in the Arab world is inspired by the valiant Tunisian uprising and almost all aspire to recreate that example in their own authoritarian milieu. However, what is the likelihood of a spillover effect? a domino effect of sorts? We've heard of several self-immolation attempts and protests in Algeria, Libya, Egypt, Jordan and Yemen. This blogger is cautiously optimistic. The factors behind the Tunisian case are unique resulting from a highly educated middle class, military reversal against Ben 'Ali and a state-society contest fomented by social media outlets. In the days leading to Ben 'Ali's demise, Twitter was abuzz with up-to-date tweets on all things Tunisia. Following twitter accounts of Takriz, Nawaat and some Tunisian friends, we were captivated by the turn of unfolding events. Tunisians took the streets to protest a despot and his mafia-style family. Despite initial sheepish concessions from Ben 'Ali, Tunisian bloggers and activists maintained the pace of the uprising through constant tweets. Even after the collapse of the police state of Ben 'Ali, Twitter continues to play a major role in the post-uprising debates on the future trajectory of the country. Some of these accounts are from primary sources. Case in point is former dissident blogger Slim Amamou, current minister of sport and youth, who live-tweeted in the midst of the ministerial cabinet meetings. While the Tunisian case shows how new technology can be utilized to wage cyber-revolutions to buttress social street protests. This is particularly important in the absence of a clear-cut revolutionary leadership structure. Framing the grievances against the regime was largely performed on the Internet, blogosphere, facebook and twitter accounts. This is the new frontier for most of Arab regimes in their continuous efforts to curb access to social media. This is not to say that technology solely brought down the regime, for I believe the army's principled stance against the bloodshed and the inability of Ben 'Ali to effectively reinvent his authoritarian regime relying more on political management instead of pure coercion and violence. This is not bemoaning the fall of the police state of Ben 'Ali (I was among the first bloggers to celebrate it), but questions of success and failure of the Arab street have to be conceptualized in comparison to other seemingly similar cases in the region. Ultimately, the revolt is a testament to the resilience of the Tunisian people, who set the example for all Arabs fed up with the their regimes' transgressions. Thank you for this. I will re-tweet it.